I just thought a few people would like to see this. 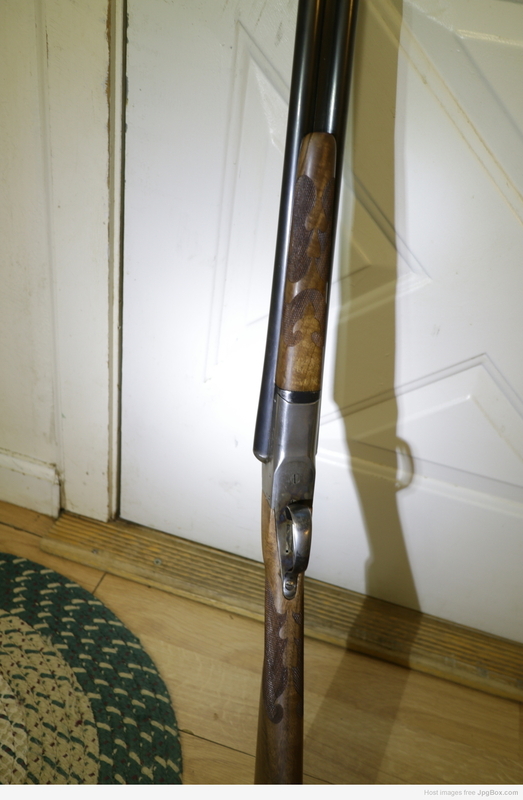 I will admit that it's a 12 gauge and not a 16, but it's the one I am working on at the moment. 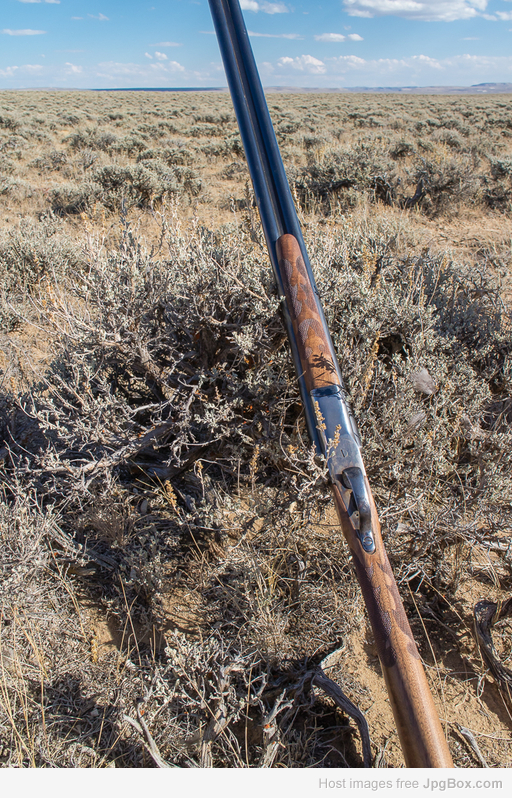 The gun is a Lefever Nitro Special that I purchased from a close friend before he moved to Montana. We spent some wonderful time hunting ducks and geese together and he is the one who originally talked me into exploring North Dakota 20 years ago. Yes, the gun is special to me. Each pattern I make is unique since I just mask the stock and pencil whatever strikes my fancy into the space available. I then cut out this stencil with a hobby knife before digging out the checkering tools. I like a lot of curves. As a result I have one special shorty cutter I modified that gets into all of the smaller nooks and crannies. The job isn't perfect, but this is only the 4th gun That I have checkered. If you look real close, there are some minor imperfections that I can live with. At least it is borderless. I never did like the look of bordered checkering. 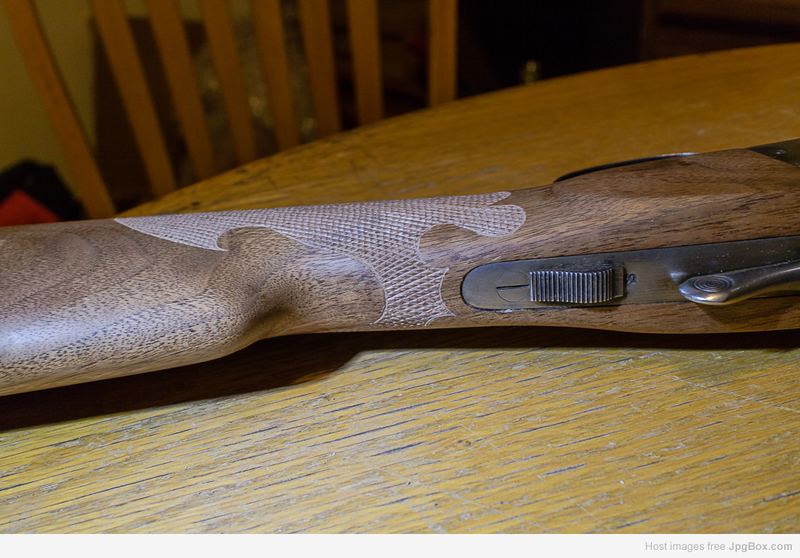 Anyway, here are the grip checkering pics before I treated the checkering with thinned down epoxy. Amazing work for only your 4th try! You should have seen my 4th effort. Yikes. I especially like the underside view. Great job! Well done. The piece of walnut looks better than any I've ever seen on a Nitro. 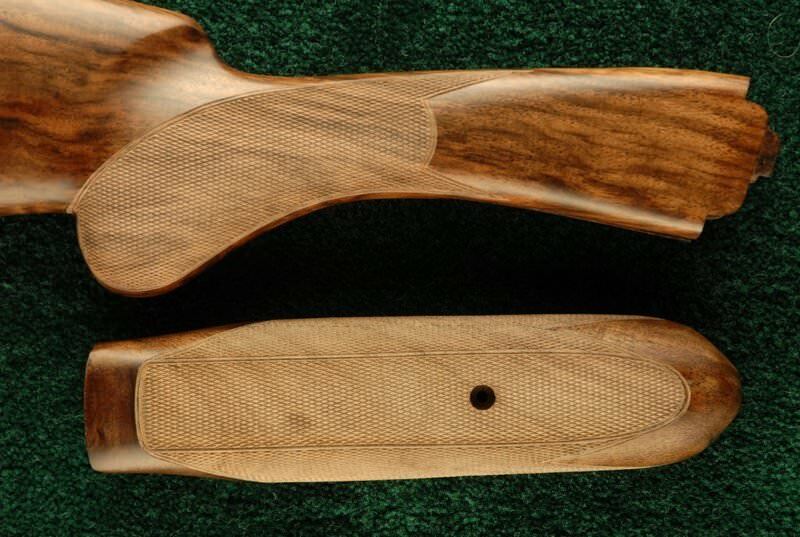 i picked up a well worn Nitro 12 at an auction a few years back and reshaped it into a straight grip, fluted the comb and did a 2 point checkering pattern on it, but it didn't turn out half as well as yours. Very nice work. I was surprised at how nice the fore end wood was once I stripped it down. The factory finish really obscured the grain. I started reshaping my N.I.D. 16 to straight grip tonight. No fancy checkering for it though, just matching up the original stuff. Someday the N.I.D. will get complete wood upgrades so there is no need to go elaborate now. It looks great. I've thought about dabbling in checkering myself. I think it would be enjoyable and therapeutic. I had to try the gun out today. Wow what a difference the sharp checkering makes as to how the gun feels in my hands, I must say that I like it. Doubled on sage grouse, always a good omen. I kinda like dabbling with checkering myself.First it was recutting old checkering. Then full blown checkering. Nothing that advanced,all those curves would give this old man a migraine. Very nice job! I do some checkering myself. I'm like you i DON'T like double borders. Theys used to hide over runs. I must say i like the curnes. I do dome curves bur not to the extent you went. That i havent mastered. Maybe its the type of tool . I dont know. However i commend you on a very excellent work. Dont stop now. 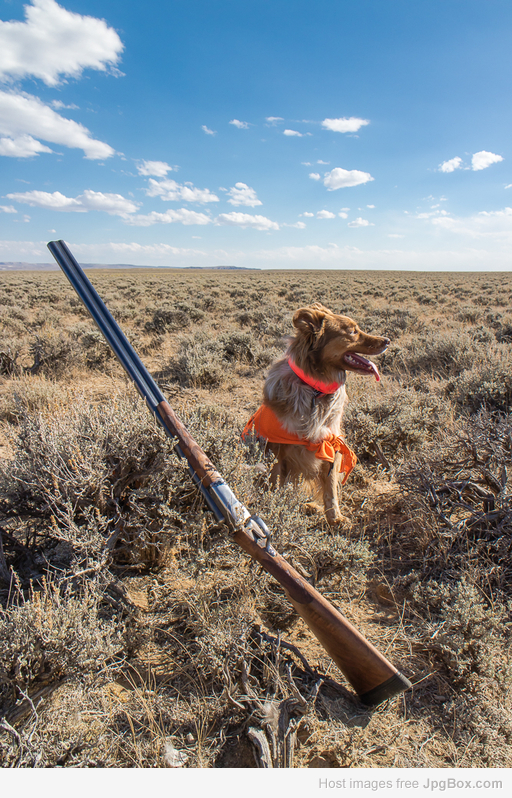 The gun and Rusty look good to go on hunting. 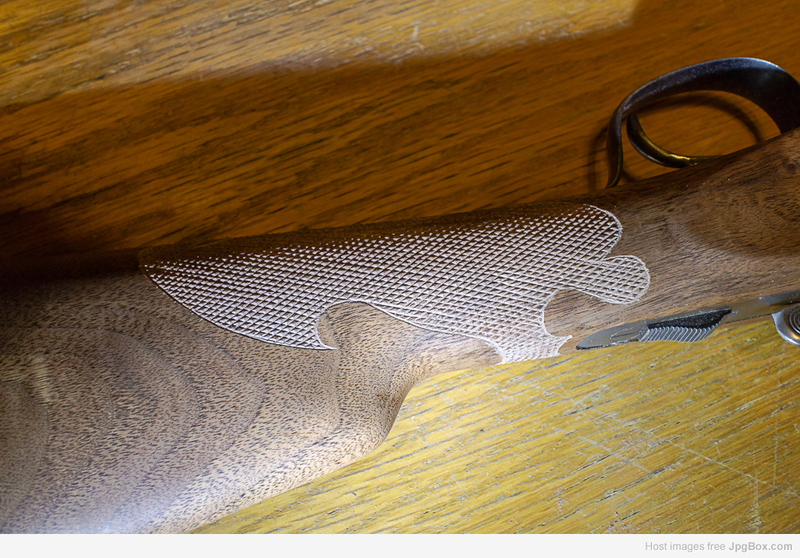 The checkering job looks great , but I also really like the matt finish on the stock . What did you use ? Hats off to you on having the courage and dedication to do your own checkering. Back in the '90's, I took all the stock making and finishing courses at the NRA summer gunsmithing schools at Lassen Junior College. 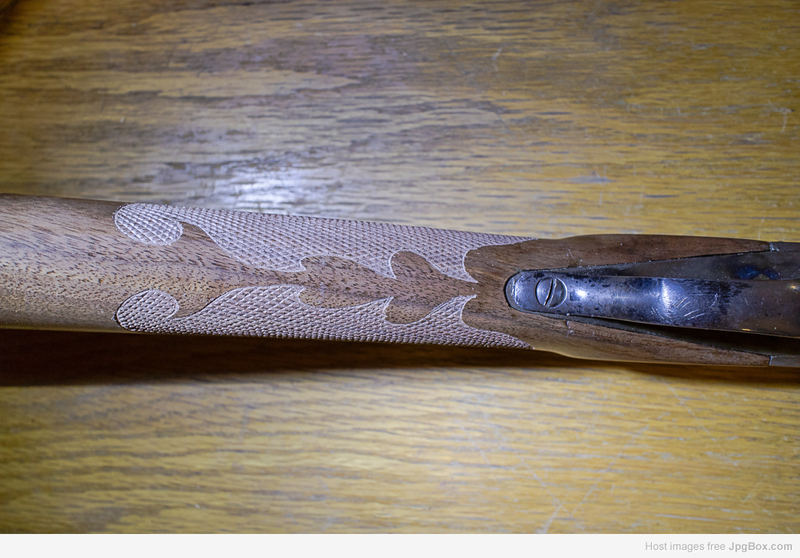 The final course I took was the stock checkering course where you had to custom design a pattern to fit the grip and forend, transfer it to the stock, lay out the master lines and finish checker. I completed the course with an "A" grade, but what I really got from the course was that as long as others are willing to take my money to checker a stock, I'll pay for having it done. I'm just not temperamentally suited to spending endless hours cutting those rows into the wood. You done good, pilgrim. That is a nice matte finish as someone else commented. I'm going out on a limb and guessing a sanded in Truoil finish which is also my all-time favorite. 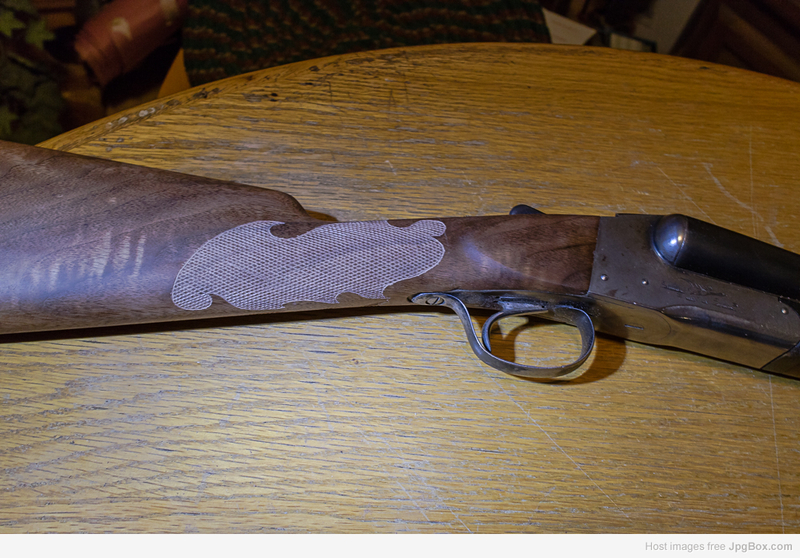 My last effort with stocking was a fitted/unfinished stock by Wenig, sanded in Truoil matte finish, and checkering by Clint Meier of CGM Gunstock Checkering. 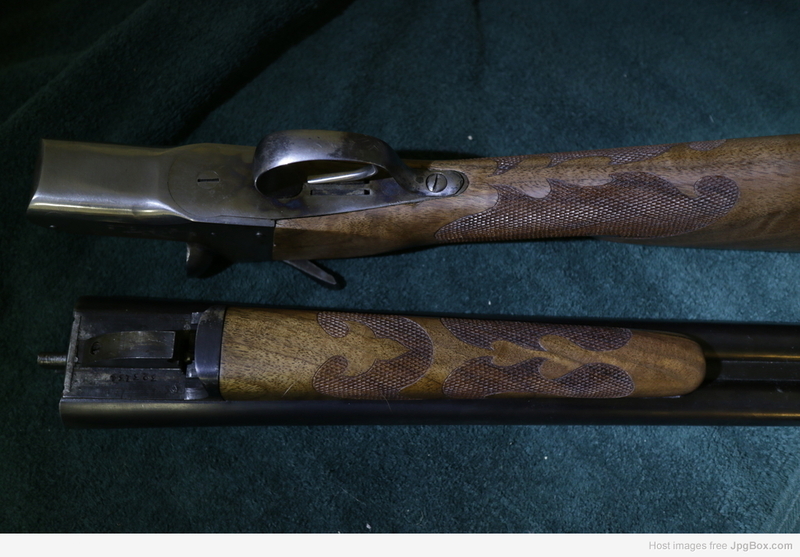 All that on an $800 16 ga TriStar Brittany.... the checkering cost more than the gun is worth. Oh well, I got what I wanted. The finish is satin polyurethane, hand rubbed final coat.